Warhol's works which incorporated urine as an artistic medium are divided into two different categories - Oxidation Paintings and Piss Paintings - in the Andy Warhol Catalogue Raisonné. 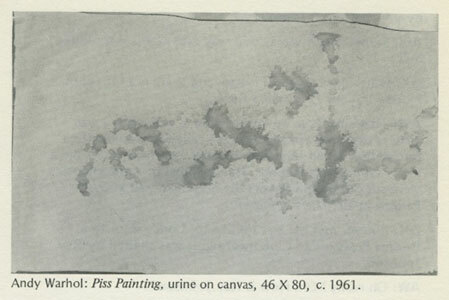 The Piss Paintings are described as works where "primed canvas had been stained with urine" in contrast to the Oxidation Paintings where "stained canvases were prepared with a metallic ground." Piss and Oxidation paintings found in Warhol's studio appear to be from 1977 to 1978, although the cat. rais. also makes reference to one which was illustrated in a magazine in 1976 and was among those found in Warhol's studio. It was a "Piss" rather than an "Oxidation" painting. A possible inspiration for the piss paintings was the popularity of watersports among sections of the gay community.